Ready to finish this up? I am, for sure. I don’t like to tackle huge projects like this without breaking it up in chunks so I don’t get discouraged. 10. Pin the bodice lining pieces right sides together to the dress bodice making sure that the corners all line up. At this point the straps are lying in between the bodice and the bodice lining hanging down. 11. 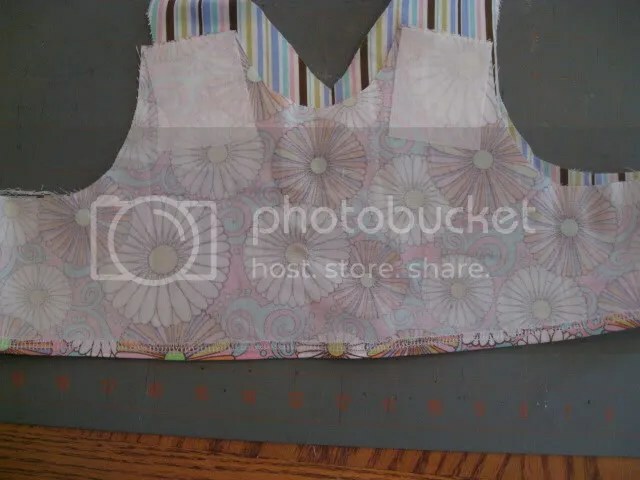 Sew around the top edge. Trim the seam allowance and grade the seam allowance at the V in the center. 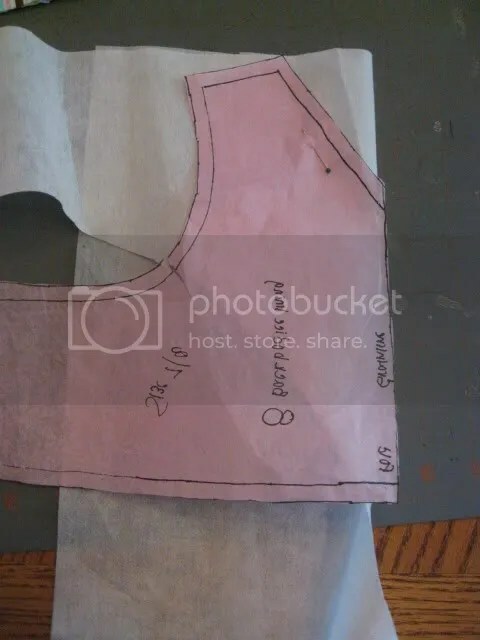 “Grade the seam allowance” might sound weird, but all it means is to make little cuts in the back bodice piece in the V. I drew some on so you could see; just make some snips right up (but not over) the seam. 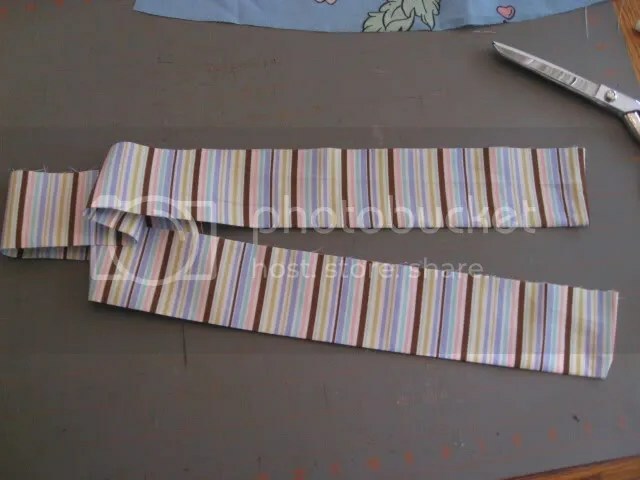 Next, trim your corners where you have a 90 degree turn, just the corners on the straps and where the buttonholes go. Last trim around any curved part of the bodice with pinking shears. Or you can clip your curves. You want to clip and trim close to the seam, but don’t go over! 12. 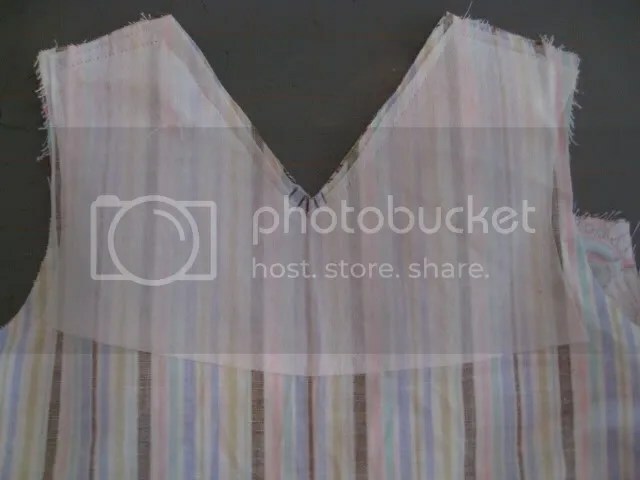 Turn the bodice, press and topstitch the top edge. 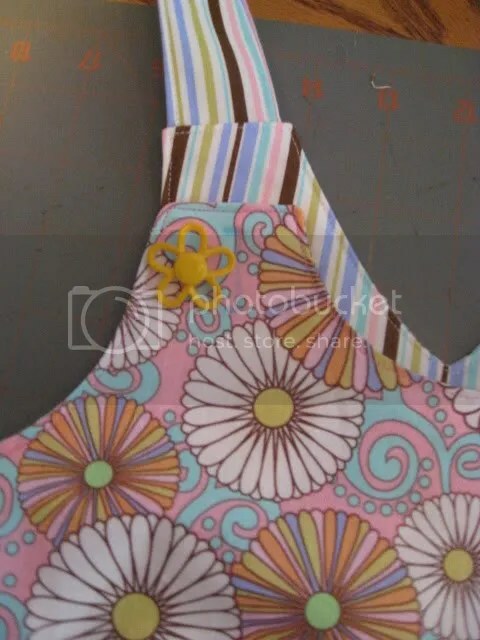 Use a bodkin (or something) to poke the corners out. Do not skip pressing! I know you were thinking about it! 13. Under the arms sew a row of stitching approximately 1 cm or 3/8 in. from the underarm seam. This should extend slightly beyond the side pieces. Now just stitch over your dots. 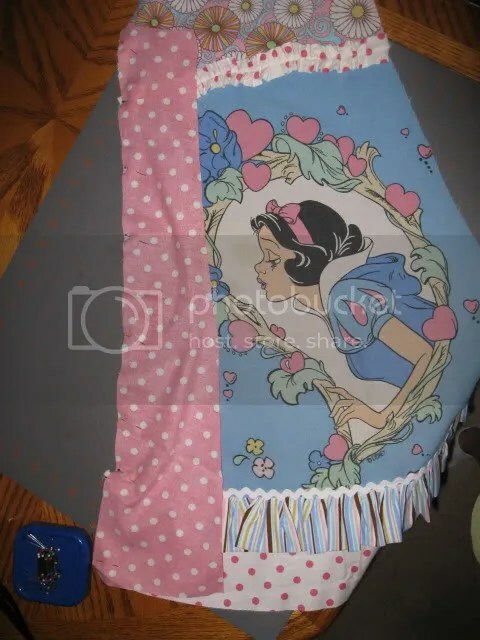 Start at one side and backstitch and then follow the dots (or line if you connected them) to the other side and backstitch to lock. 14. Thread a piece of elastic through the resulting casing. Stitch one end of the casing, securing one end of the elastic. Try the dress on and cinch the elastic to the desired fit, pin the elastic. 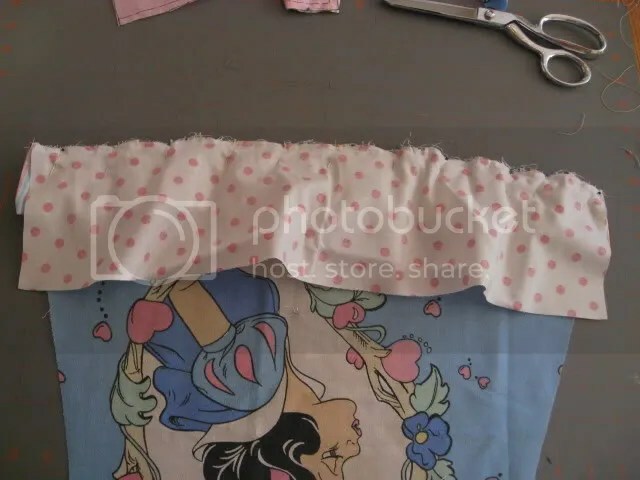 Stitch the elastic in place and trim any excess. Stitch the button holds and attach the buttons. 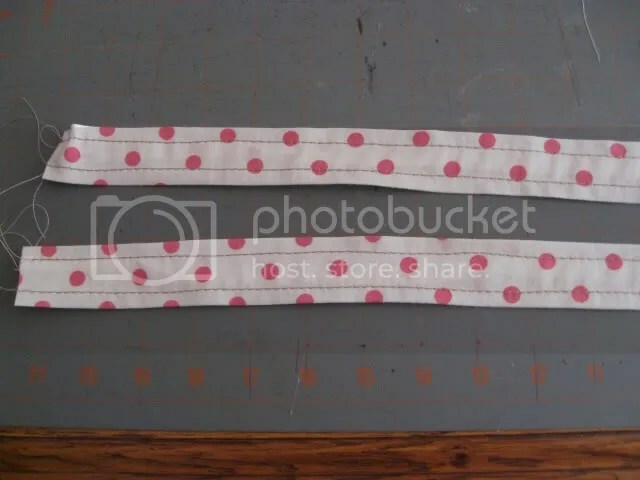 My side pieces measured at 6 inches across so I cut my 1/4 inch elastic at 4 inches. Do have your model try it on if she is available. 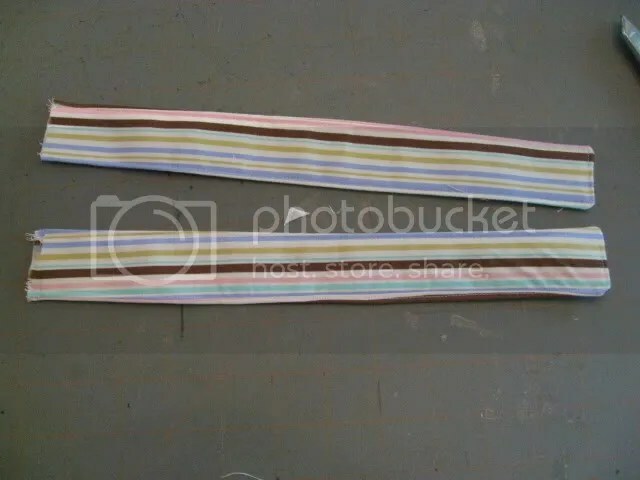 The shorter you make the elastic the more difficult it is to thread and attach it though. Now remember which way you pressed your side seams. 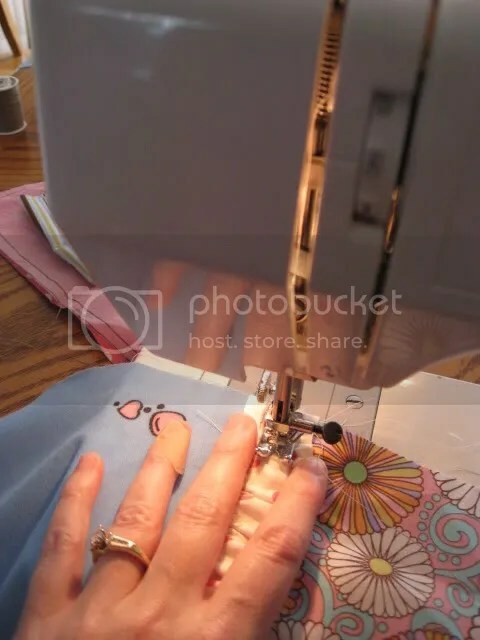 If you were paying attention they are pressed toward the back so you are going to want to thread the elastic from the front and ending in the back so it will be easier to navigate that side seam that is right in the middle of the casing. Work the safety pin in between the bodice and lining to the casing and push it through. When the end of the elastic just peeks out from the beginning opening of the casing, sew the casing closed. I follow the topstitch line for the side piece to make it easier. Don’t forget to backstitch: you don’t want your stitches coming out! Continue to thread the elastic through and when you get to the other end pull a little bit of elastic out and sew the other end closed. I don’t like my lining flopping around, so I tack it down at the side seams. 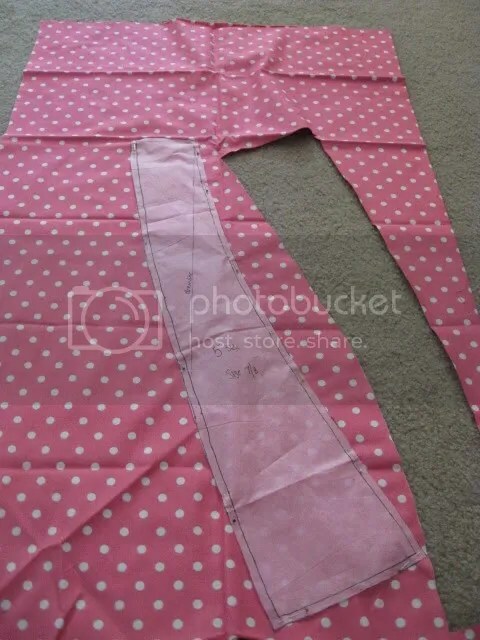 I just take a needle and thread and attach the lining to the seam with a few stitches. It won’t show from the front and will keep the lining inside, where it belongs. You will be better prepared than me and have buttons all picked out. Yellow flowers was all that I could find that remotely matched so that’s what we’re going with today. 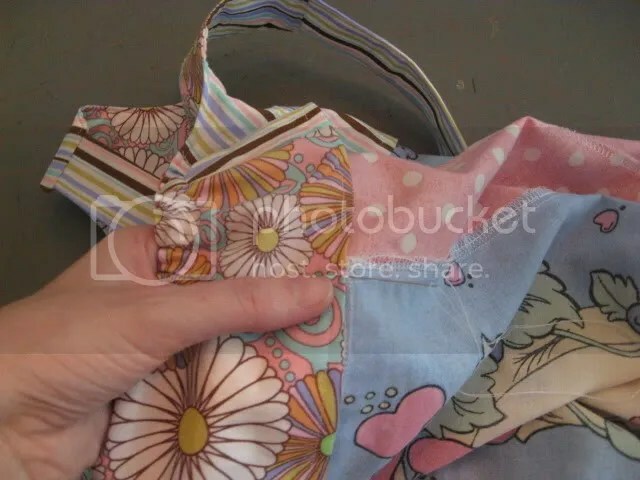 Mark your buttonholes (or button holds, according to farbenmix) with a fabric pen. 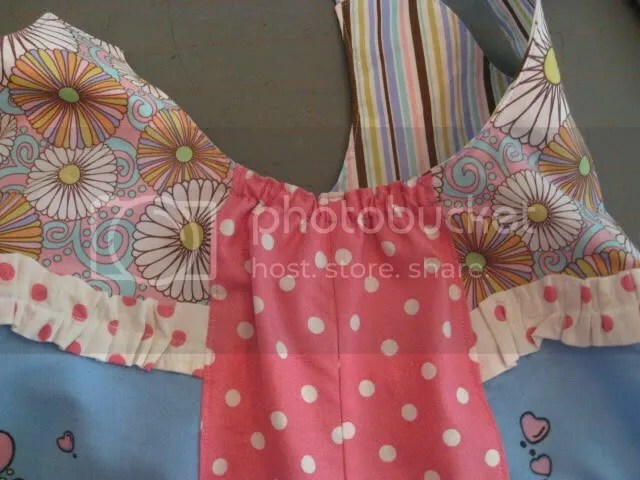 It should look like a capital I.
Sew your button holes, and sew your buttons on the straps and you are DONE! Great job! I would love to see your vidas, so please let me know if you found this tutorial helpful. Notice anything different? I decided to add a line of ric rac over the seam between the middle and the lower pieces. 4. 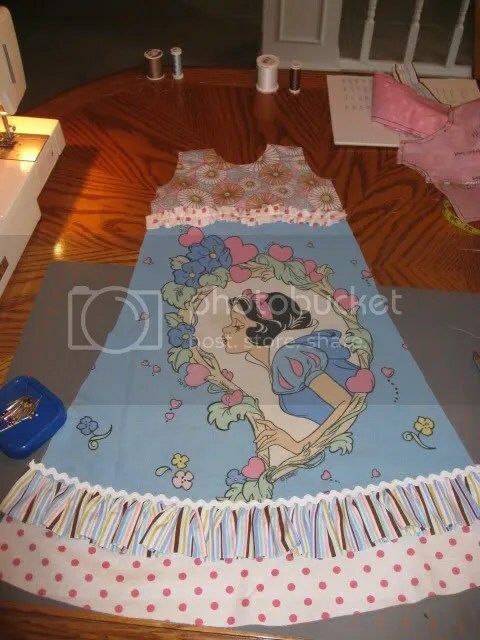 Stitch the side pieces and place them right sides together on the front and back middle dress pieces and stitch. 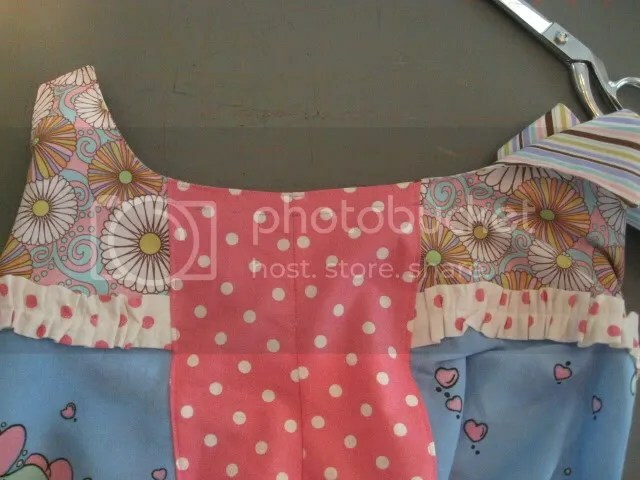 Press the seam allowance towards the side pieces and topstitch. 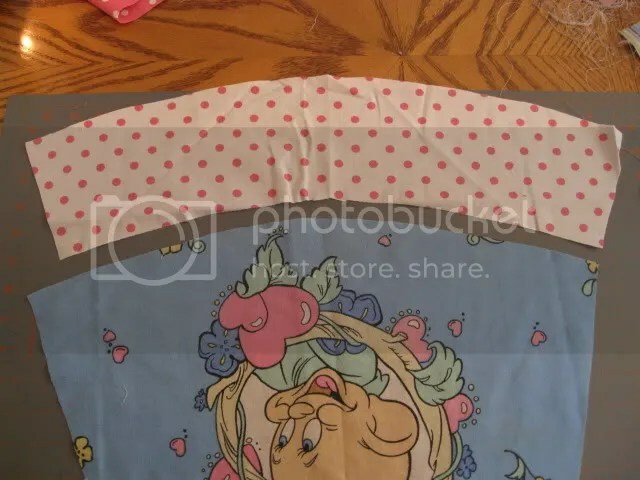 If you have any ruffle action going on, you might want to pin the bottom of the ruffle inward so it’s out of the way of the stitching. Flip the side piece over and pin. 5. 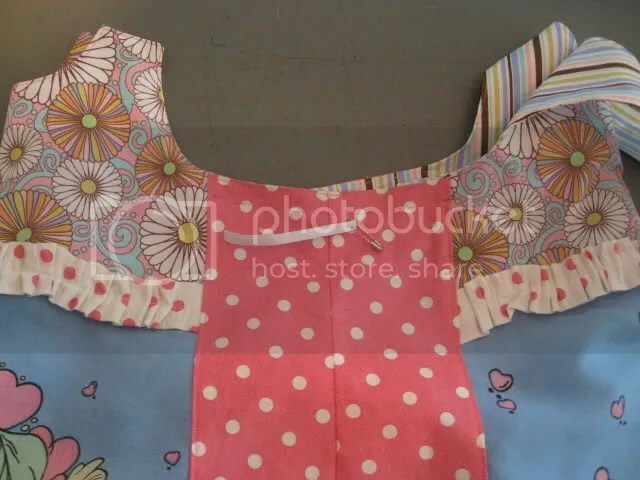 Lay the front and back dress pieces right sides together, pin and sew the side seams. Hem. 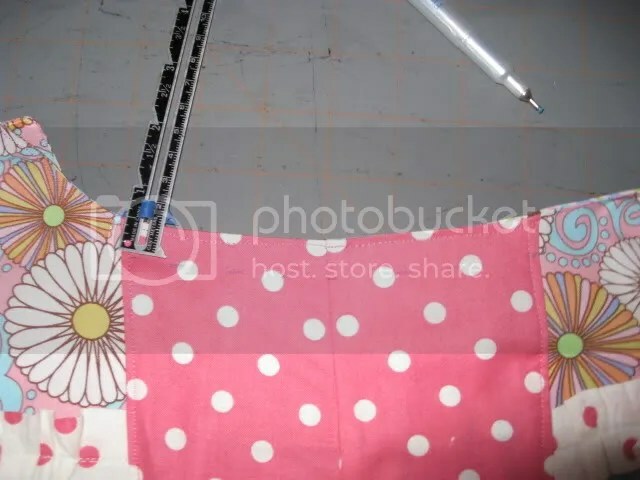 I learned from Carla it is much easier to press the hem on a straight edge instead of a tube, so I press the hem now and then I unfold the seams and stitch the sides together. So then stitch and serge (or zig zag) the side seams and press them toward the back of the dress. Then refold the hem and sew it. 6. 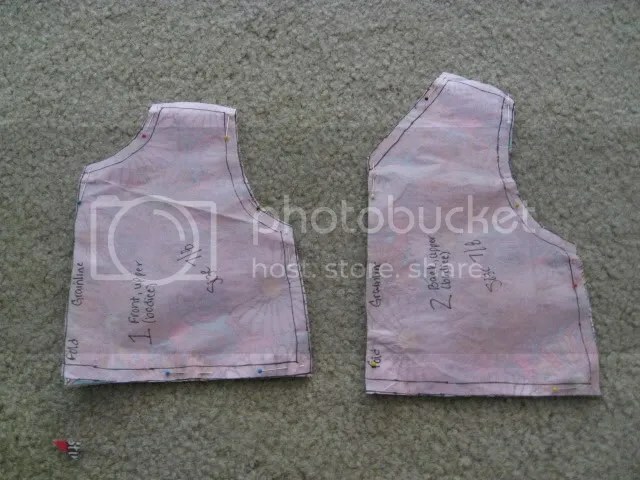 On the bodice lining pieces, iron on two small pieces of fusible interfacing where the buttonholes will be made. 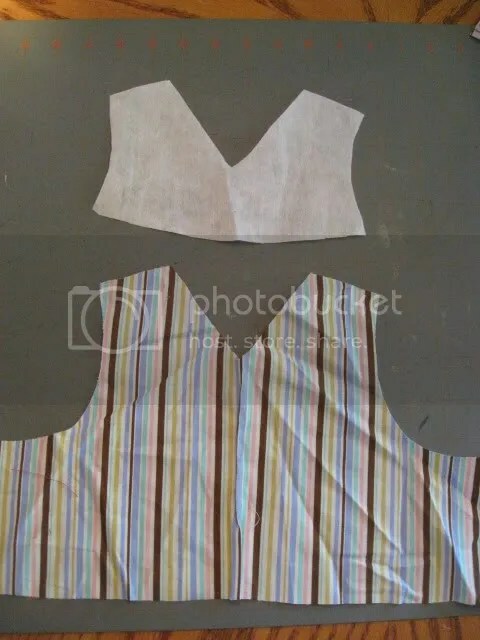 Do the same in the middle of the back bodice lining to strengthen at that point. 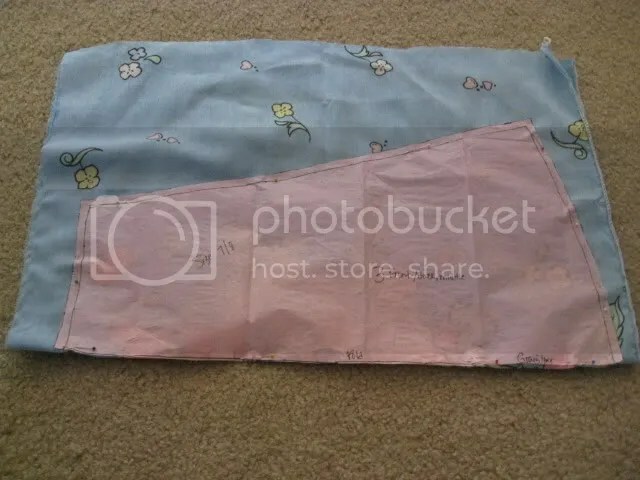 So for the front lining piece I cut two rectanglish squares of interfacing and iron on the back of the front lining piece where buttonholes will go. 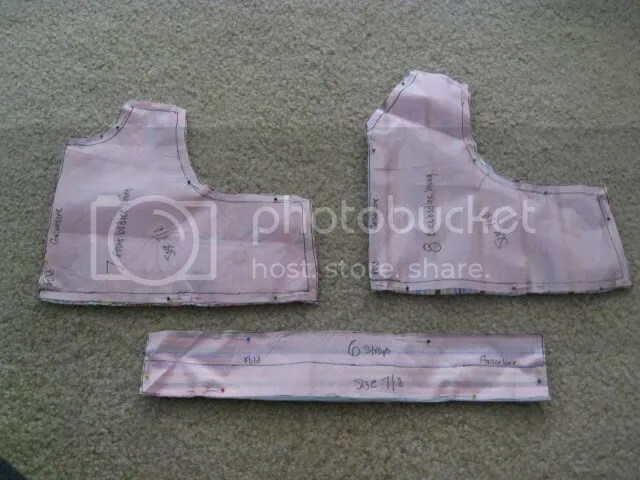 For the back lining piece I take the pattern piece and cut out the interfacing and then trim a little all the way around. 7. 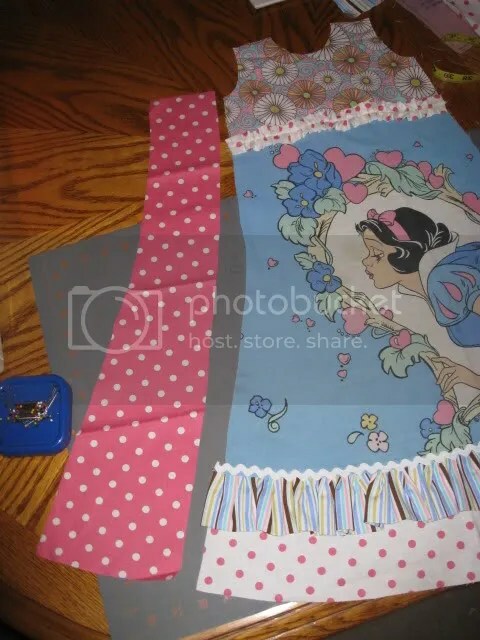 Fold the strap pieces in half lengthwise and stitch each of the long edges and one each of the short ends. Turn the shoulder strap pieces and press. Topstitch along the edges of the shoulder straps. 8. Take the unfinished shoulder strap ends and pin them onto the right side of the back bodice and stitch into place on the seam allowance. Nothing much to add here, except make sure the prettiest side of the straps is facing the bodice when you attach it. 9. 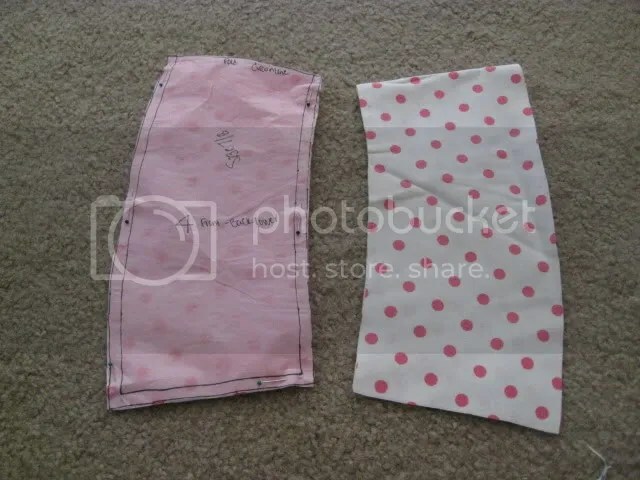 Take the bodice lining pieces and sew them right sides together along their side seams. Hem the bottom edge. Again, I press the hem before sewing the pieces together. I serge the bottom of each lining piece, press it up and then unfold and sew the lining pieces together. Then I refold and press and sew the hem. Ok, let’s take a break! We’re almost done: next we’re going to put it all together! 1. 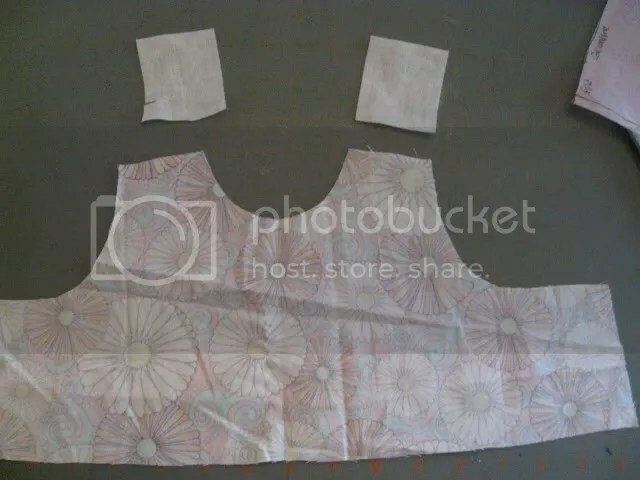 Finish all edges of the cut out pieces with zig zag or four-thread overcast stitch. What? That is completely unnecessary. Skip that. 2. 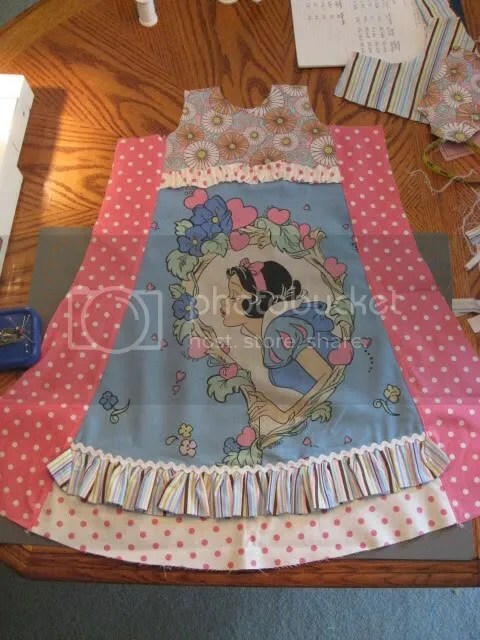 With right sides together, place the upper front and back pieces onto the middle dress pieces and stitch. Press the seam allowance upwards and topstitch. Stitch the two together, zig zag or serge and then press upward. A little hint about pressing. Start on the wrong side and press the seam upward and then flip it over and press it again. It makes it lay nicely. 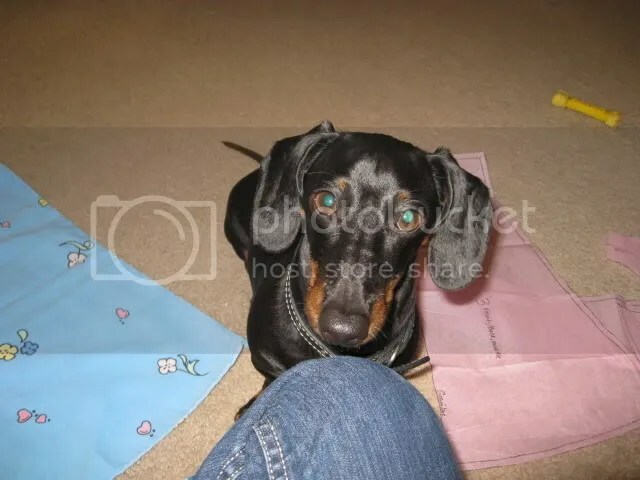 Then topstitch if you want. Because we are adding a Euro ruffle over the seam it’s not necessary but if you are a stickler for rules by all means do it. Repeat for the back pieces. Let’s talk about Euro ruffles. I am not a big fan of the rolled hem look. I think it is cute as a lettuce hem on knits but don’t really care for the look on regular cotton. 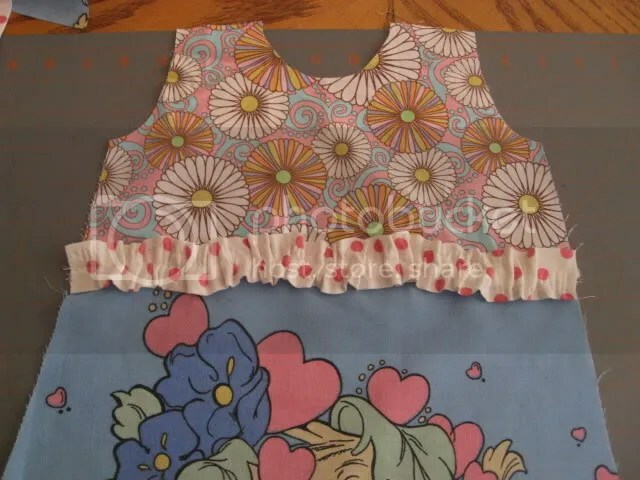 It just looks messy to me, I think because my mom taught me to sew and you just didn’t do that. Fortunately, Heather taught me a way to do Euro ruffles that is slightly more tolerable. Take out the gathering stitches and you’ve got a Euro ruffle! I guess it’s not too bad, but it’s still not my favorite. 3. 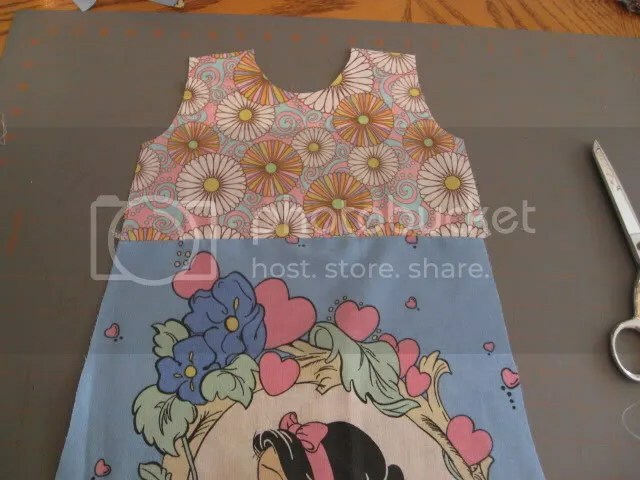 Stitch the lower front and back pieces onto the middle dress pieces in the same way. Press the seam allowance upwards and topstitch. This time I am going to add the ruffle before I stitch. 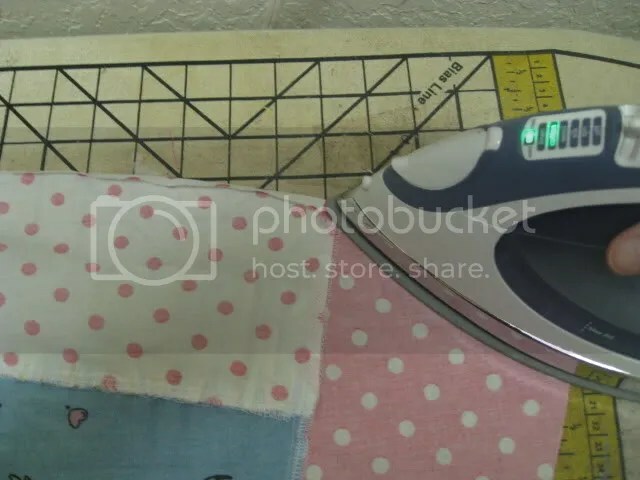 Take your strip and fold it lengthwise, right sides together. Stitch along the ends and turn right side out and press. Run two sets of gathering stitches on the raw edge side of the strip. I usually start this 5/8 inch from the edge, so I don’t run over my gathering stitches when I sew the ruffle on. 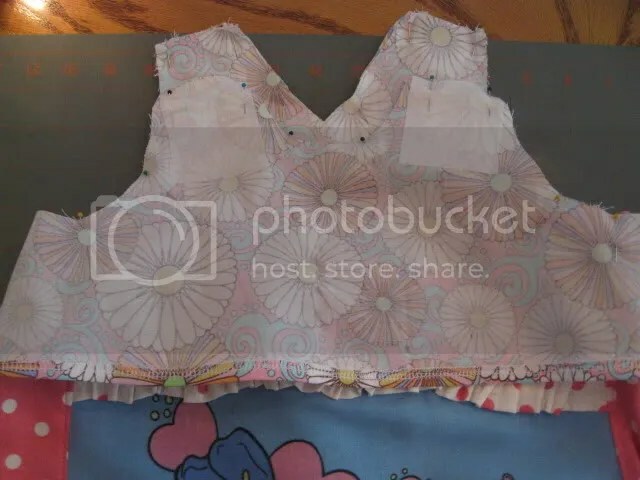 Pin the ruffle to the top of the lower piece (4), gently pulling at the gathering stitches. Sew the ruffle on the lower piece (4), making sure to sew closer than your seam allowance so the stitches don’t show. Because my seam allowance was 1/4 inch, I sewed the ruffle on at 1/8 inch. Take out the gathering stitches. 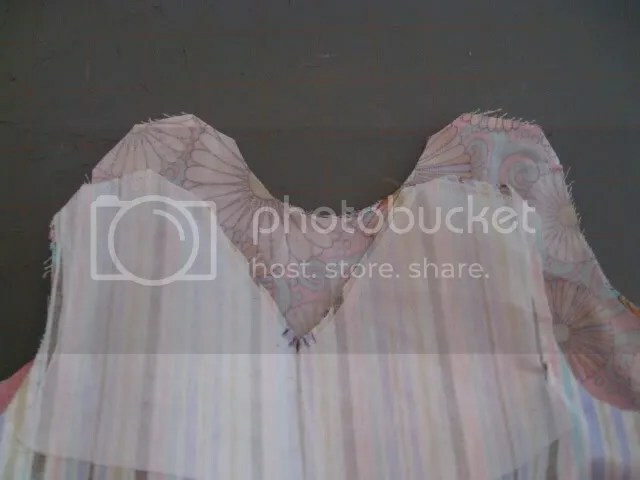 Pin the top of the lower piece (4) to the bottom of the middle piece (3), right sides together, sandwiching the ruffle in between. This is what the two pieces look like without the ruffle. Just flip it over and pin. Here is what they look like pinned with the ruffle in between. 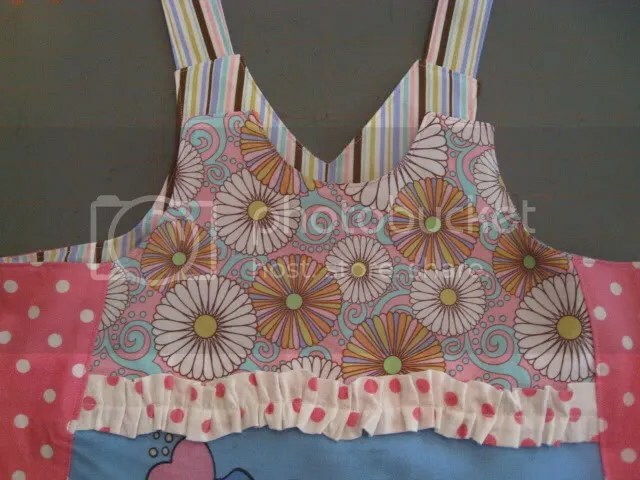 So sew the pieces together, zig zag or serge the edges, press upward and topstitch. Repeat for the back pieces. Now we are at the end of Part Two and we only completed steps 3 out of 14, but don’t be disappointed. Look at what we have done so far! Look how cute it is already! And now that we are done with ruffles, it will go a lot quicker, I promise. 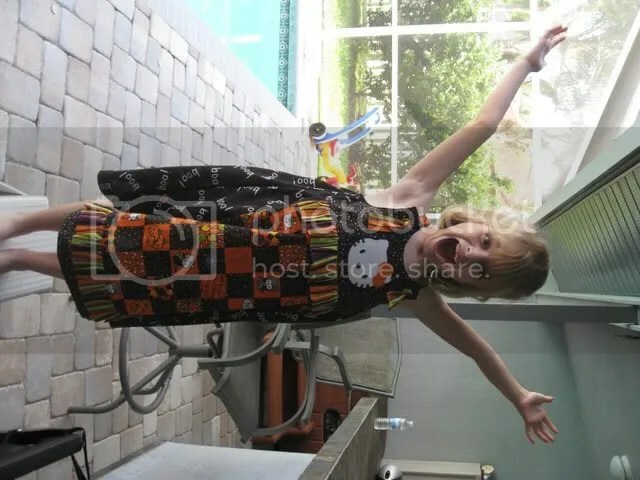 I decided to do a Vida sew along this week. Hopefully I will get it done before we leave town tomorrow to pick the kids up. 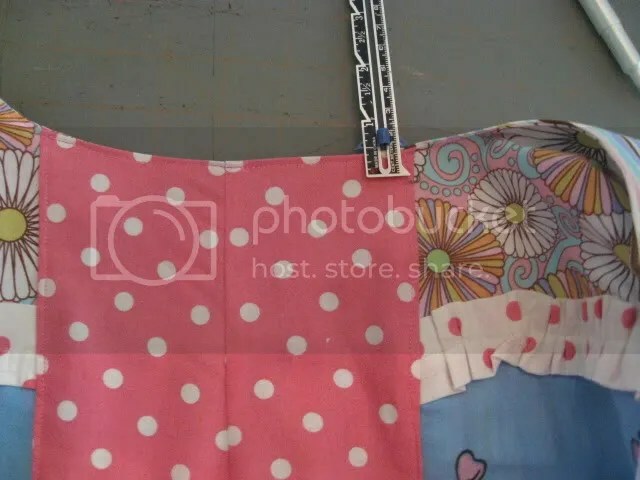 What’s the sewing equivalent of your eyes being larger than your stomach? Cause I have that, bad. 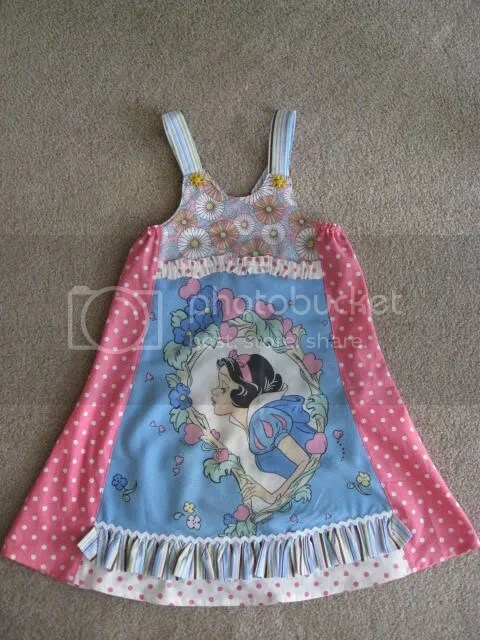 I want to finish this sew along, make a dress for my mother and make some pj pants for Jacob. By tomorrow, of course. What? Quit chattering about it and get started? Ok! As Megan has so helpfully modeled here, you need fabric for the top front piece, top back piece, the top and back middle pieces, four side pieces, two bottom pieces, straps, lining and any ruffles you want to add. Next is (3) front and back middle section, cut two of these on a fold. 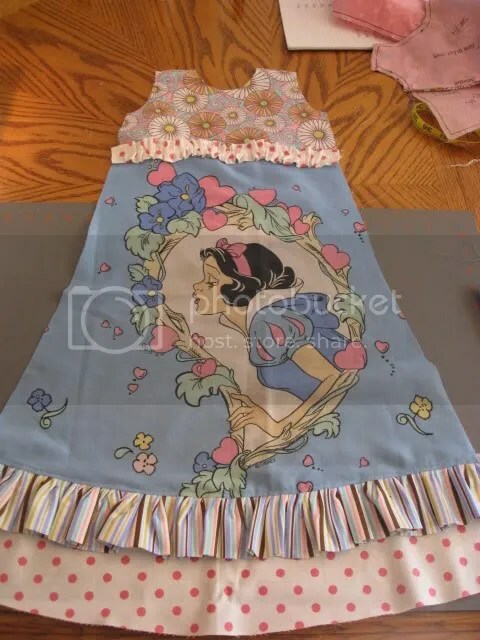 Some people like to do big appliques on this section. 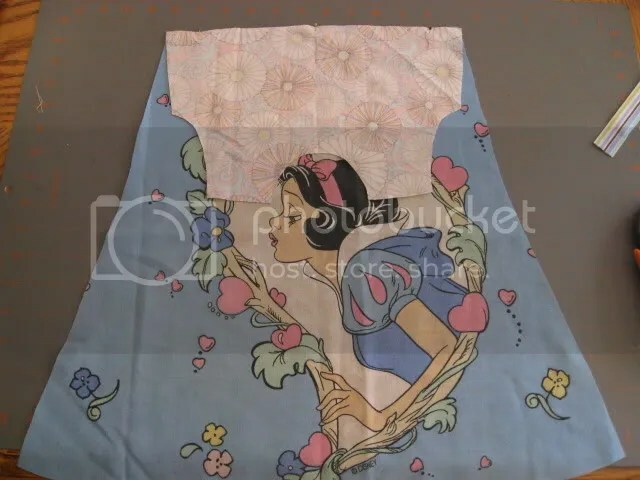 I like to cheat and use a pillowcase! Next is (4) front and back lower section, cut two of these on a fold. Now the sides (5). Let’s talk about the grainline first. On this piece the grainline is running diagonal across the pattern piece. What does this mean? How do you place it? 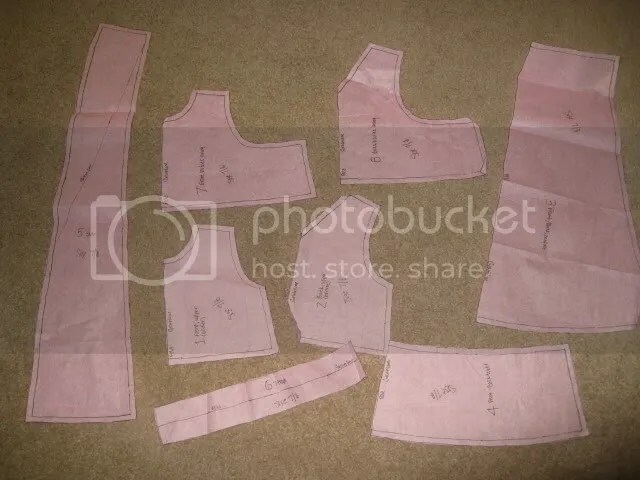 Last are the straps (6) and front and back lining pieces (7) and (8). 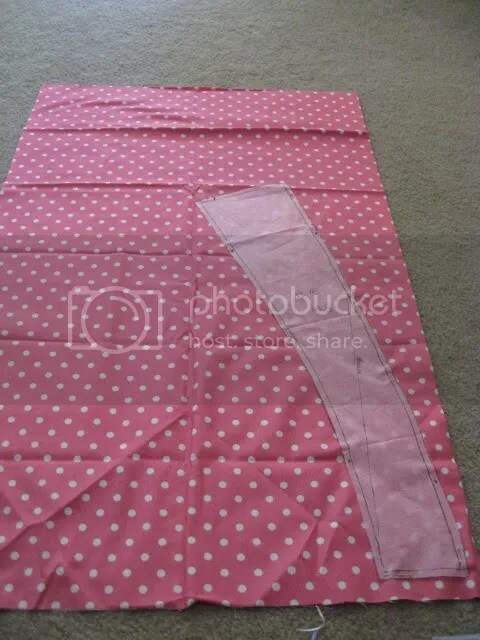 Cut out 2 straps and one lining piece each on the fold. Hey you are almost done! You just need to cut out any ruffles if you want them. 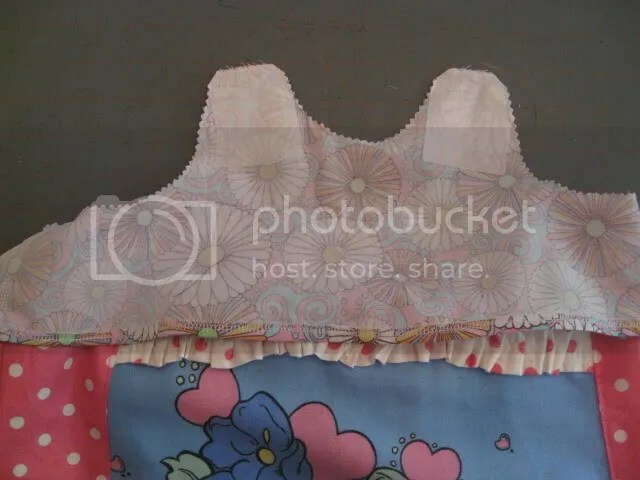 Most people put ruffles on the top and bottom of the middle piece, so measure the width of the top and bottom and double for the ruffle. 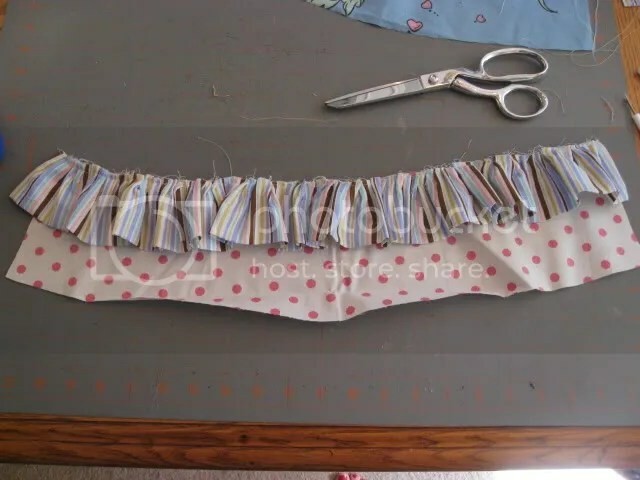 I am going to do one regular ruffle on the bottom so I cut strips to equal 24 x 5 inches and one “Euro” ruffle on the top so I cut a strip 22 x 3.5 inches. I double over my ruffles so I take my desired finished ruffle length (2 for the regular ruffle and 1.5 for the Euro ruffle), double it and add 1/2 inch seam allowance. It’s totally a personal preference though. 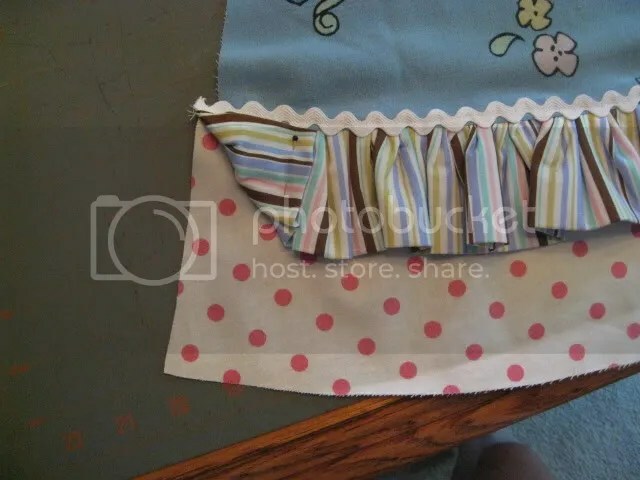 Instead of ruffles, you can also add ric rac or other trim. Time to take a break! Stay tuned for Part Two!